Since I prefer frozen local strawberries over the fresh strawberries available during our winter, I freeze a lot of local berries when they are in season, mostly mashed or sliced. In no case do I add any sugar; these berries are deliciously sweet on their own. Take stems off the berries using a strawberry huller and brush off any visible dirt (do not wash). For mashed berries, slice berries and place in bowl. Mash gently with a potato masher. * Put in freezer containers and pack berries gently with a fork so that juices completely cover the berries. Do not fill to the top of the container as mixture will expand as it freezes. Most freezer containers have a suggested "fill level" line. I think berries prepared in this manner work best for Strawberry Shortcake and as a middle layer for Chipotle Chocolate - Olive Oil Cake. This is also the most space-efficient way to freeze berries. By comparison, a quart of frozen sliced berries when thawed yields less than 1/2 a quart of sliced berries and juice. For sliced berries, slice berries and place on a piece of wax paper on a cookie sheet. Place in freezer just until slices are frozen. Remove sliced berries from paper and place in freezer container. Return to freezer immediately. Sliced berries are especially good for salad (Weeds with Pecans and Fruit) and cereal topping. Sliced or whole berries are good for early spring Strawberry Rhubarb Crisp/Pie as rhubarb comes into season well before strawberries. For whole berries, place berries in container and freeze. When freezing whole berries, the container can be filled to top as there is enough "air space" for the berries to expand as they freeze. A full quart box of berries weighs ~ 1 pound, 8 ounces. 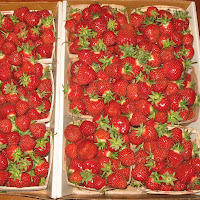 A quart container of sliced, mashed strawberries weighs about 1 pound, 15 ounces. This is by far the most space-efficient way to store frozen berries. * Or skip the bowl and as shown above put slice berries in freezer container and mash dirrectly in container. This Christmas I ended up with several strawberry stains on my linen tablecloth. When stain remover did not seem to work, I checked on line and found that vinegar is good for removing strawberry stains. Sure enough, it took several applications followed by gentle brushing but the stains did disappear and the cloth washed clean. Had I not used the stain remover/prewash, and gone straight to the vinegar as some sources suggested, the process might have been quicker. Will keep this in mind for future stains on clothing.